Gnanavisuddhi, R. (2015). A study on a brief mindfulness-based intervention for stress reduction and wellness among school teachers. Counseling Master Thesis, Help University, Malaysia. 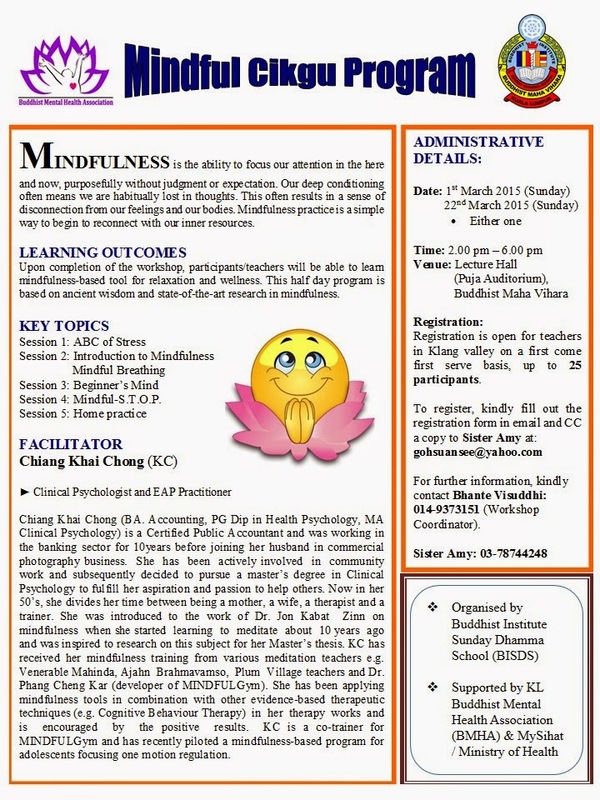 Forty school teachers in Klang Valley participated in a half-day mindfulness-based workshop - Mindful-Cikgu (see above). 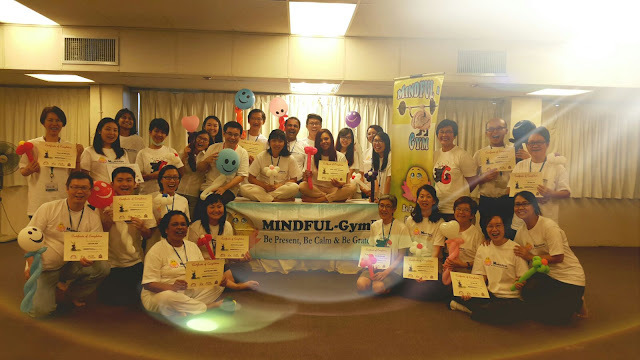 Immediately after the workshop, there were significant reduction in levels of perceived stress; and increments in mindfulness and subjective happiness. 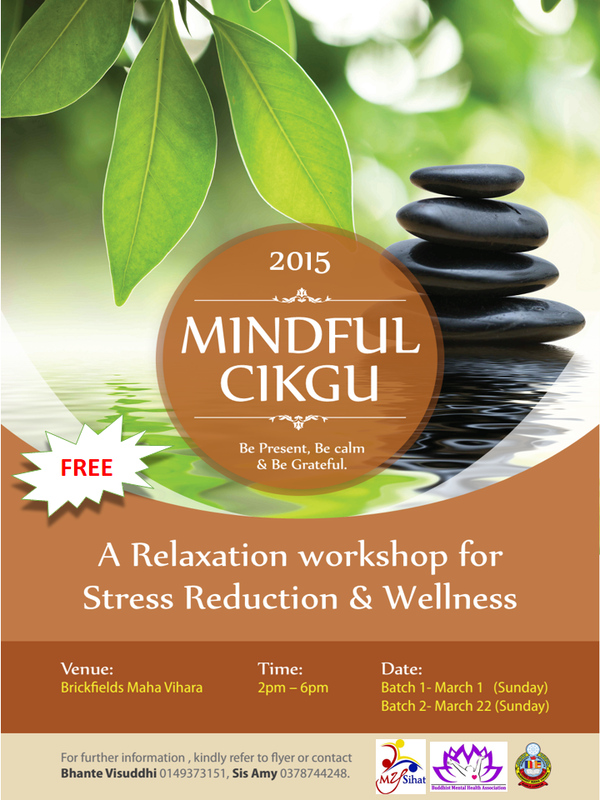 However, one month after the workshop, only improvement in level of mindfulness was maintained. Regular mindfulness practice and booster workshops are recommended to enhance the long-term effectiveness of the program. 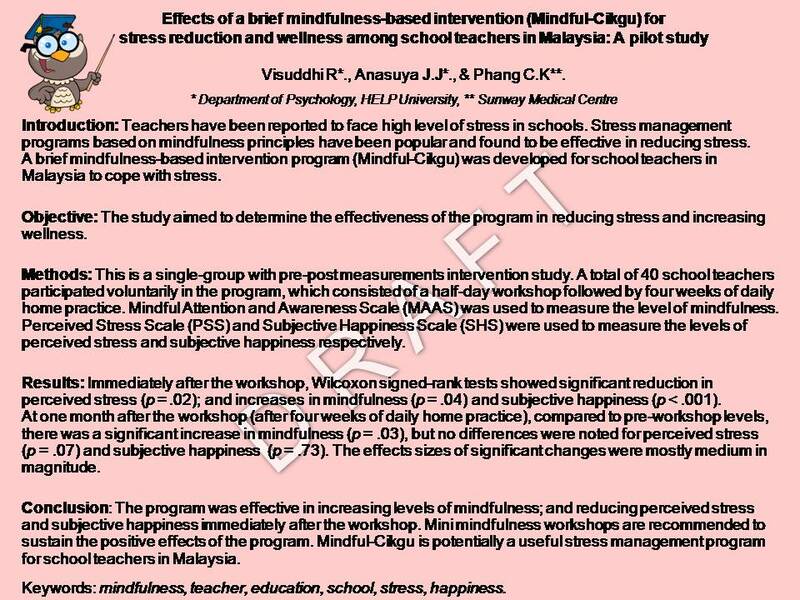 The pilot study is part of Venerable Visuddhi's final year master's in counseling research project. Since then, he has graduated from Help University. We've developed 3 MINDFULGym training plans for corporates. If you're interested, feel free to email Dr. Phang (pckar39011@gmail.com) for further information. Copyright © 2010 by Dr. Phang Cheng Kar (Zhen-Phang). Theme images by merrymoonmary. Powered by Blogger. 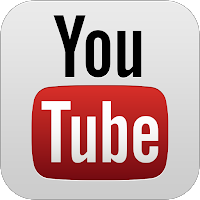 Permission is granted for use of materials in this blog for a non-commercial educational purpose. 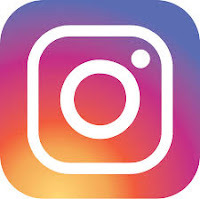 Kindly let me know (pckar39011@gmail.com) if you're using the materials so that I can rejoice on your wonderful sharing. 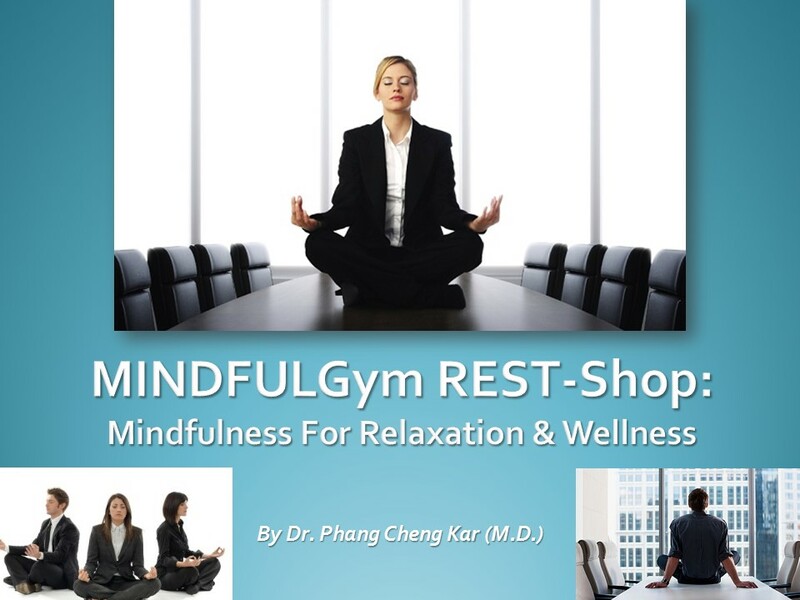 For acknowledgement, you may cite, "Courtesy of MINDFULGym (mindful-gym.blogspot.com) by Dr. Phang Cheng Kar." 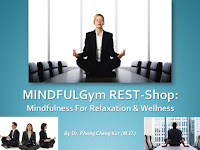 Except otherwise mentioned, all materials found in MINDFULGym blog by Dr. Phang Cheng Kar is licensed under a Creative Commons Attribution-NonCommercial-ShareAlike 4.0 International License.